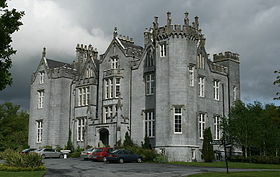 Kinnitty Castle is a Gothic revival Castle located at the foothills of the Slieve Bloom Mountains. The Castle has a long and turbulent history. The first castle at Kinnitty was destroyed in 1209 and later rebuilt by the Normans in 1213, who were subsequently driven out by the powerful Gae3lic Clan, the O Carroll’s of Ely. During the Norman period, an Augustinian Abbey was established near the Castle parts of which are still visible notable the famous High Cross and Abbey Wall. In 1630, William O Carroll built a new Castle close to the Abbey but this was confiscated by the English Forces as part of the Plantation of Offaly or Kings County as it was then known. In 1664, the Castle and its Estate was granted to Col. Thomas Winter as a reward for military service. It was subsequently sold by Col. Winters descendants to Bernard family in 1764. In 1811, Lady Catherine Hutchinson, wife of Thomas Bernard, commissioned the famous Pain Brother Architects of Dromedary Castle and Adare Manor, to extend the Castle to its present status today, a magnificent example of neo gothic architecture. Unfortunately, in 1922, the castle was set alight by the Republican forces as part of the 20th Century campaign for Independence. In 1928, the castle was restored and the Bernard family continued to live there until 1946, when it was sold to Lord Dedes, who in turn sold it to the Irish State in 1951. In 1994, ownership transferred from the Irish State into the private sector and it was transformed into the luxury hotel it is today. The castle is open all year around to passing visitors and for those who wish to enjoy it luxury accommodation, Georgian restaurant and bars. The library bar houses a unique collection of antique books and journals which are complimented by the exquisite Louis XV style drawing room where one can relax with a friendly drink or two.